Join the Historic Frenchtown Association for a family friendly event of music, games and time to relax and enjoy your friends and neighbors. This month will feature a dessert buffet, bring one to share! Frenchtown Fridays are held at the Frenchtown Heritage Museum, 1121 N. 2nd from 7-10pm., the first Friday of each month from April to October, activities and food will vary from month to month. The events committee will meet to discuss upcoming events. Come learn about what’s happening in the neighborhood! 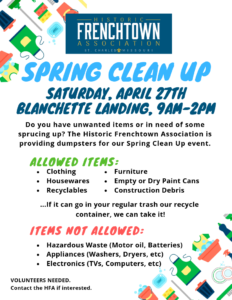 Spring Cleanup will be on Saturday, April 27th from 9:00 AM to 2:00 PM at Blanchette Landing. 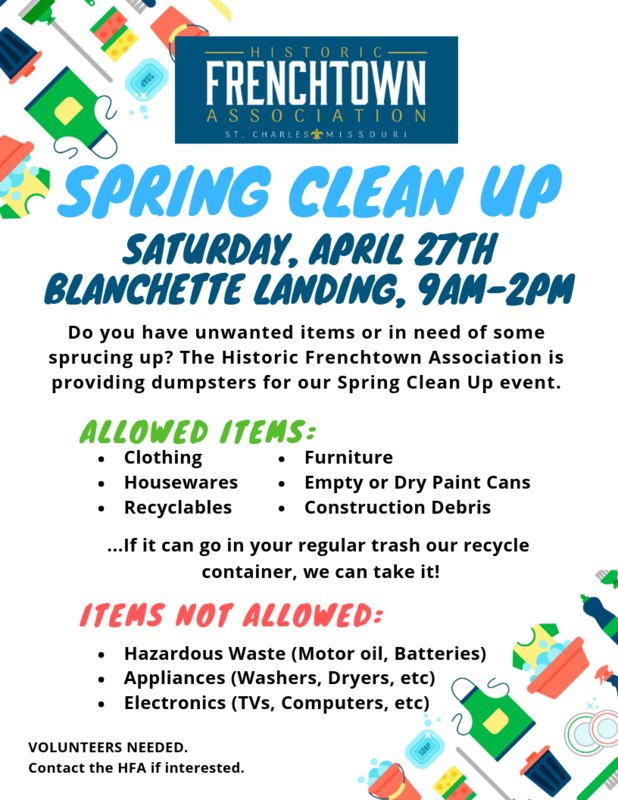 The Historic Frenchtown Association is providing dumpsters for our Spring Cleanup event. Allowed Item: Clothing, Housewares, Recyclables, Furniture, Empty or Dry Paint cans, Construction Debris – If it can go in your regular trash or recycle container, we can take it. Not Allowed: Hazardous Waste, Appliances, Electronics. If you need assistance bringing your items to the drop sight, please email the HFA by Thursday so that arrangements can be made. Resources for assistance are limited and will be handled on a first come basis. All pickup items that are prearranged must be located at the curb.